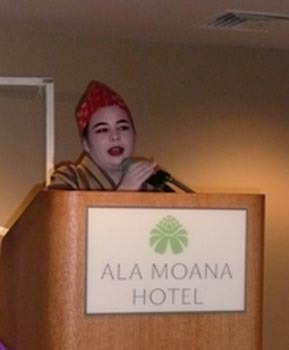 Mistress of Ceremonies, Lisa Shishido, welcomed everyone to Hui Makaala's 63rd year since being chartered back in 1946. Judy Shimabukuro gave the invocation to the intimate crowd to begin the delicious lunch. 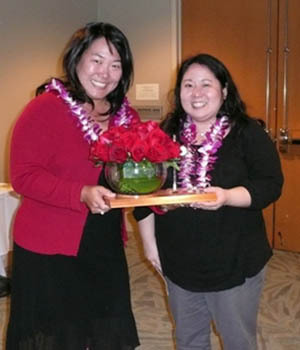 A beautiful crystal vase with clock was presented to outgoing 2008 President and Uchinanchu of the Year, Val Kato. Val then presented her farewell speech thanking everyone for their support and loyalty. With the introduction of the 2009 incoming officers, Former Senator Patsy Young, conducted the swearing-in ceremony with a unique blend of colors depicting each office. 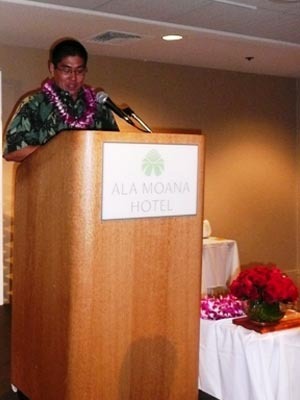 The exchanging of the gavel and message from the 2009 President, Rena Takushi, then followed. Hui Makaala was privileged to have as the guest speaker, Ryan Towata, an educator with the Department of Education, (Liholiho Elementary). Ryan gave an inspiring message of his career aspirations to teach and steer our young people toward achieving a great future. 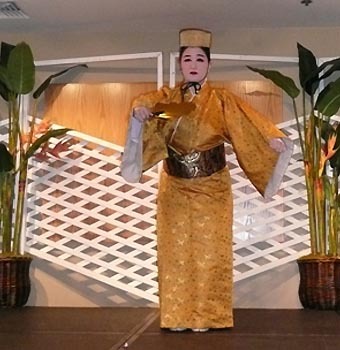 President Rena honored us with her recently-acquired talent of Okinawan dance. Rena is currently a student with the Tamagusuku Ryu Senjukai Ryubu Dojo, under the leadership of Sensei Frances Nakachi. Sensei Nakachi opened the program with the ceremonial tradition of Kagiyadefu. Other dance students sharing their talents were: Shasta Yamada, Eric Kobayashi and Ainoa Miyashiro. Lisa Shishido awards Val Kato with the Uhchinanchu of the Year plaque. 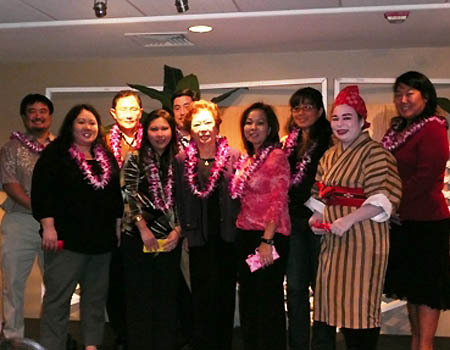 Officers and Directors: (R-L), Ryan Okunaga, Val Kato, Dennis Shimabukuro, Vicki Kitajima, Reid Yamashiro, Patsy Young (who conducted swearing in ceremony), Liz Teruya, Carol Morimoto, Rena Takushi (President) and Lisa Shishido.